The Westmead Breast Cancer Institute (BCI) achieved a significant milestone in January 2019 with its flagship BCI Sunflower Clinic delivering 10 years of breast screening at MYER Parramatta. 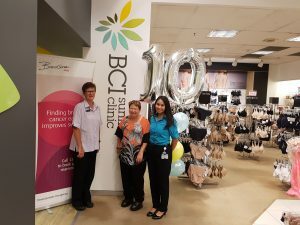 Since its launch in the intimate apparel department of MYER Parramatta in January 2009, the BCI Sunflower Clinic has become the most successful screening site for BreastScreen NSW. Created to offer women seven-day-a-week access to free breast screening mammograms in a retail environment. BreastScreen NSW is a free service which aims to reduce deaths from breast cancer through early detection. It is a service available to all women aged 40 years and over, but in particular those aged 50-74 years. A sentiment shared by BCI’s administration officer, Barbara Dunne – “I think breast screening is very important, it can save many lives.” Attending to reception duties since day 1, Barbara has been an integral part of the service delivery at the clinic in Parramatta since its launch in 2009. Likewise for BCI’s resident radiographer – Sue Ho – “It has been an honour being part of the clinic at MYER Parramatta. Working with clients and being able to make a difference in their lives is what I enjoy most about my role. Having a mammogram can be uncomfortable for some, but a few seconds of discomfort can be life-changing!” said Sue. The collaboration between the Westmead Breast Cancer Institute and BreastScreen NSW, and partnership support from MYER has seen the clinic at Parramatta excel in its service delivery. An average of 200 women are screened at Parramatta every week. Accommodating pre-booked appointments, walk-in clients, group bookings for screening and interpreter supported visits – every day is a unique experience for staff, clients and support service providers at the BCI Sunflower Clinic in MYER Parramatta. The BCI Sunflower Clinic in MYER Parramatta is located on level 2. It offers a range of appointments, including Thursday evenings and weekends. “It is wonderful to know that so many women have made the time to undertake a 15 minute breast screen, which could potentially save their life.” says Associate Professor Nirmala Pathmanathan. Having regular mammograms with BreastScreen NSW is the most effective way of detecting breast cancer early, when more treatment options are available, and when chances of survival from this disease are the greatest. Western Sydney has 6 other BCI Sunflower Clinics for BreastScreen NSW where women can go for their free screening mammogram. These include the MYER stores at Blacktown, Castle Hill, and Penrith, as well as hospital based clinics in Auburn, Blue Mountains and Mt Druitt. A GP referral is not required to make a booking with BreastScreen NSW, women simply need to call 13 20 50 to make an appointment.